When we were in Italy, Carbonara was a staple at almost every restaurant. What I love about this dish is that it uses pantry staples and it’s easy enough to make on a quick night, while having robust flavor. It uses minimal ingredients that are inexpensive and easy to find! 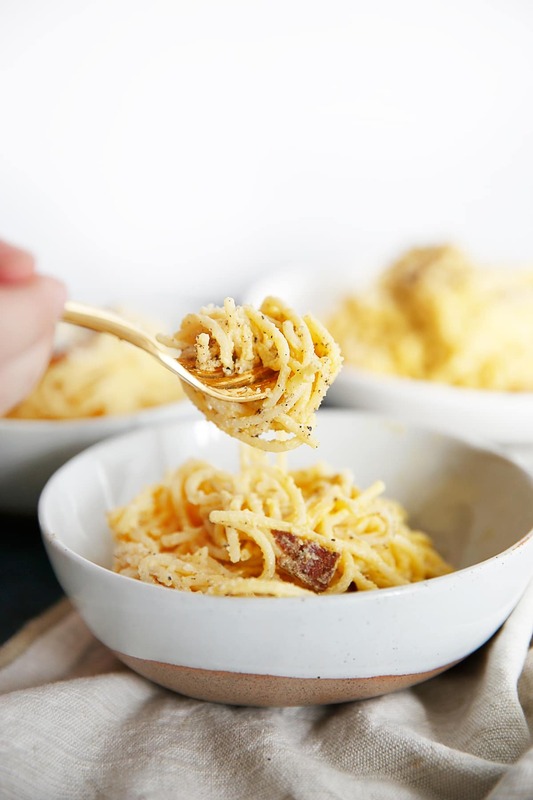 I knew I wanted to give you a perfect Gluten-Free Spaghetti Carbonara that everybody will love! You’ll feel fancy and totally surprise your family and guests. Made in partnership with ALDI. 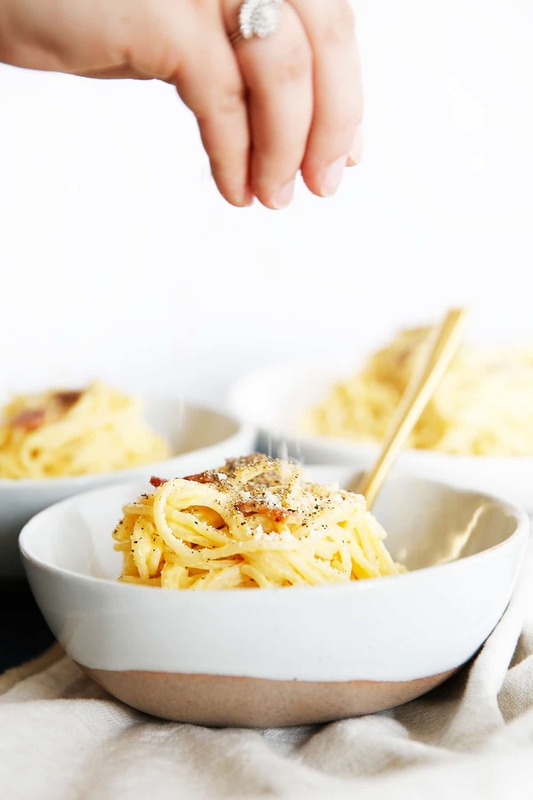 I am so excited to partner with my friends at ALDI to bring you today’s easy spaghetti carbonara recipe! It’s a total staple that’s affordable and beyond delicious. 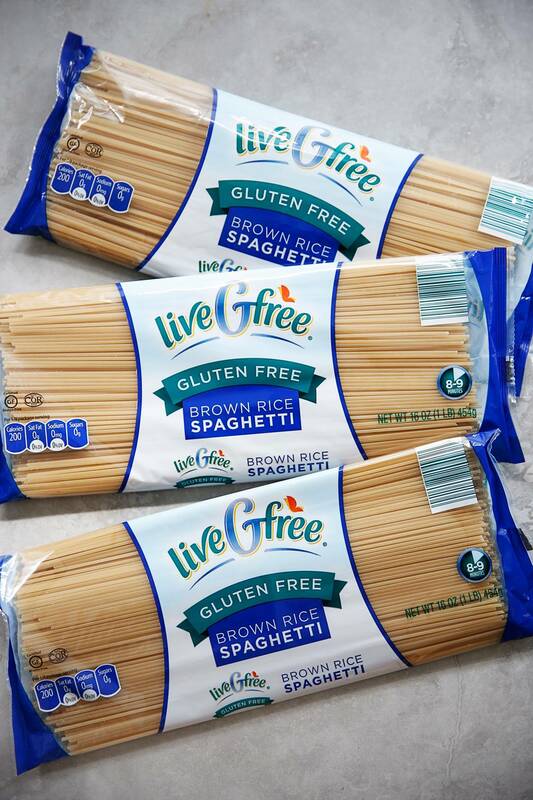 There’s more to love about the liveGfree line at ALDI! The gluten-free brand is now backed by the Good Housekeeping Seal! This means that each liveGfree product was evaluated and quality tested by the food and nutrition experts at the Good Housekeeping Institute, so you know it’s a product you can trust. They also guarantee quality on all of their private-label products. If a customer doesn’t like an ALDI-exclusive product, they can bring it back and they’ll return your money and/or replace the product! Bacon or Pancetta: I’m loving Appleton Farms Never Any! Bacon that was raised free from antibiotics, added hormones, steroids and animal byproducts. The more than 20 Never Any! meats have also earned the Good Housekeeping Seal. Because it’s only a few simple pantry ingredients, you want them to be high quality! Normally when making a cheesy type of pasta, you thicken with some sort of starch or flour, but this dish is thickened with egg yolks, making it naturally gluten-free (assuming you are using gluten-free pasta). Bring a large pot of salted water to boil for spaghetti. Cook according to package instructions. While pasta is cooking, cook bacon until crispy. If there is an excessive amount of bacon grease, as in more than 2 tablespoons drain the excess. Add smashed garlic cloves and cook for 1 minute and then remove them. You want to cook it just long enough to release the garlic flavor into the bacon. In a small bowl mix together egg yolks, parmesan cheese and black pepper. Once pasta has finished cooking, reserve about 1 1/2 cups pasta water. Drain pasta and return it back to the pot. Working quickly add 1 cup of the reserved pasta water into the egg yolk mixture and whisk together. Add this mixture to the pasta. The residual heat from the pan and the hot pasta will cook the egg yolks gently without scrambling them. The sauce should be rich and creamy, but not overly thick. Add more of the reserved pasta water if needed to thin out the sauce (see note). Add salt to taste if needed, but the parmesan cheese and bacon should be enough to season it. 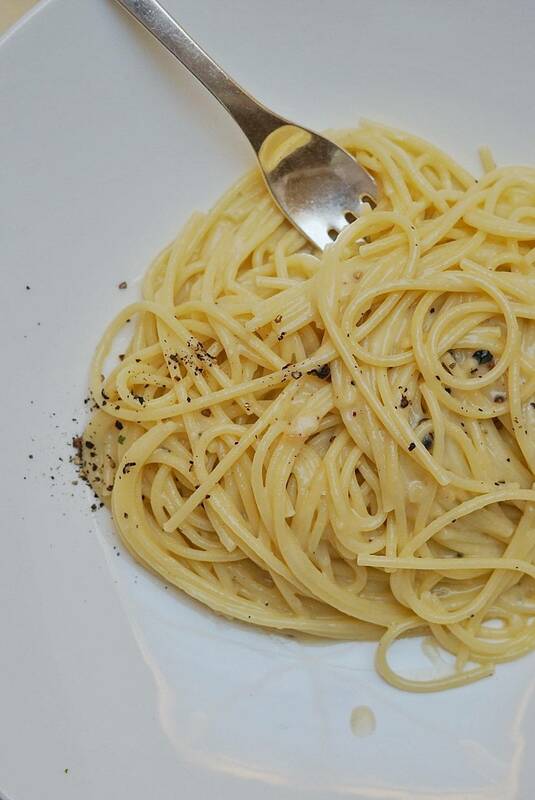 Serve immediately with additional black pepper, parmesan cheese and garnish with red pepper flakes, if desired. 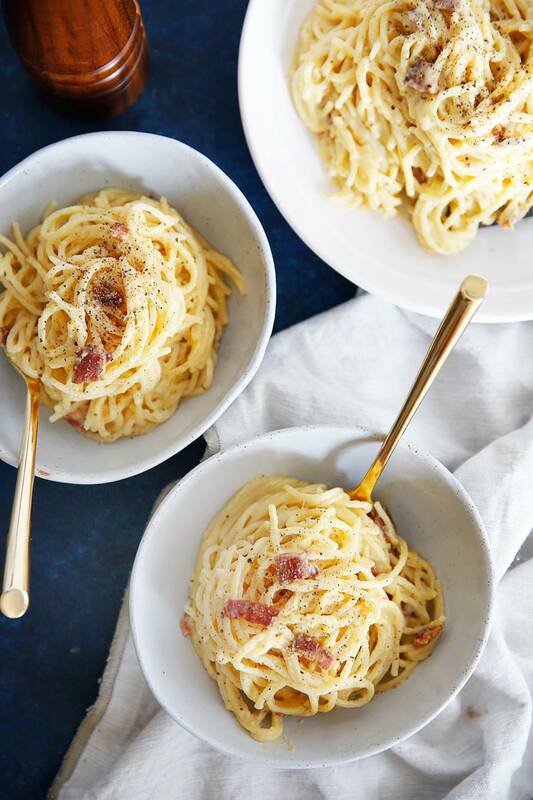 Traditionally carbonara uses pancetta. We used bacon here because you are more likely to have this on hand than pancetta. If you'd like to stick to the authentic flavor than sub in about 4 oz. diced pancetta. Depending on the brand of pasta you use, you may need more water to thin out the sauce. Here’s the lovely GF Carbonara we enjoyed in Italy at Rome Cavalleri! This post is sponsored by ALDI. All thoughts and opinions are always 100% my own! I love the integrity of their products and think you’ll love them too. Thank you for continuing to support LCK and the brands I work with! This carbonara has me drooling! This is one of my kids fave meals! I made this last night. With gf quinoa spaghetti. It was so easy and super yummy. Even my very very picky 3 year old loved it. I told him dinner was ready and he said he didn’t like it (before he was even in the room) but took one bite and said “oh! This is really good!” And ate his whole plate! Phew! Thanks for another great family friendly meal Lexi!